To 4 km from Alcañiz, direction to Zaragoza, in the item called Las Margaritas it forms a natural pit of approximately 6 km that by means of a channel of 25 km receives the waters of the Guadalope's river. It dams 11 million cubic meters. 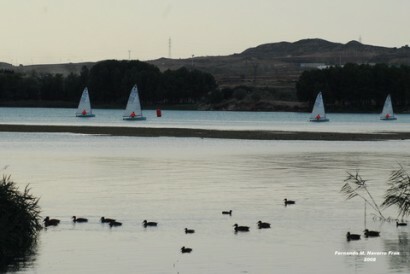 In the reservoir of the estanca it is possible to practise nautical sports not pollutant (piragüismo, sail, windsurfing, etc. ), cicloturismo, hiking, riding and fishing (trout, tent, perch, tench, etc.). The nautical sports are offered by the Club Naútico La Estanca. Eliminated his forests and cane plantations, it was repopulated of pines, and today it is one of the Alcañiz's nicest landscapes, apart from his abundant fishing and hunt.